A recent poll by the Hollywood Reporter/ Morning Consult found 62% of American adults thought “Die Hard” was not a Christmas film. And even Bruce Willis joined in the debate. “Die Hard” sits at number 11 on ranking site Rotten Tomatoes’ 50 Best Christmas Movies. It also features on best Christmas lists by Time Out, and tops movie magazine Empire’s list. The most successful Christmas movie of all time is Home Alone, with a lifetime gross $476,684,675. “Die Hard” has made box office totals of around $141, 278, 197, according to boxofficemojo. This year the British Film Institute includes contemporary comedies in its Christmas line-up, including “Gremlins” and “Home Alone”. We take a look at different criteria: soundtrack, the time frame the film is set in, viewing habits, music, anti-Christmas element and overcoming of greed. We can prove it IS a Christmas movie. Sort of. Len Wiseman‘s Die Hard 6 aka Die Hard: Year One aka McClane looks like it might actually be happening. The semi-sequel/prequel would mainly focus on a young John McClane working as an NYPD rookie beat cop during the gritty 1970’s. However, Bruce Willis’ version of the character is still very much involved as two parallel stories would be taking place. Wiseman recently spoke to SlashFilm revealing that a young version of Holly (John’s estranged wife) would be featured in the film. Although, he kept mum about when the cameras could begin rolling on it. The latest update we have concerning the project is the hiring of a couple of art directors on the film, suggesting that pre-production is already underway. The new crew additions are art directors Carol Uraneck (Captain Marvel, Netflix’s Daredevil ) and veteran James Truesdale (Venom, Just Mercy, Blade II, Big Little Lies, Mercury Rising). It makes sense they’d hire art directors first as the film will be taking place in the mid-to-late 1970’s for most of the film. Production dates are currently unknown but there is an assumption it could begin filming sometime next year as Wiseman is expected to first direct the pilot for DC Universe’s Swamp Thing. 20th Century Fox has yet to give McClane an official release date. Set against the backdrop of 1950s New York, Motherless Brooklyn follows Lionel Essrog, a lonely private detective afflicted with Tourette's Syndrome, as he ventures to solve the murder of his mentor and only friend, Frank Minna. A crime thriller that centers on a man whose memory has been lost due to a bank heist gone wrong. The character will need to piece together the missing 10 minutes from his memory in order to determine who sabotaged him. The story of legendary boxing trainer Cus D'Amato, who worked with the likes of Mike Tyson, Floyd Patterson, and José Torres. 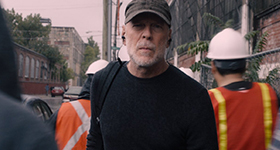 Enter your email address to subscribe to Legendary Bruce Willis and receive notifications of new posts by email.